Options: Size: 38 REG40 REG42 REG44 REG46 REG42 LONG44 LONG38 SHORT' 40SHORT"
Celebs are always being asked "Who are You wearing" by the people from the "E" network and you can too just by wearing these young man style slim fit dinner blazers and jackets by Tazio menswear. 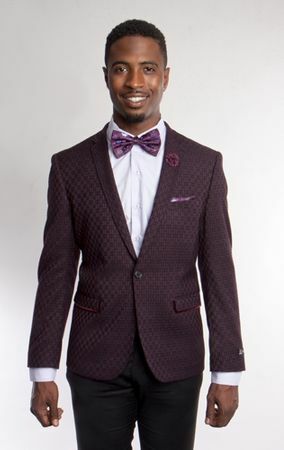 Featuring that slim fit look that you as a young man wants to be seen wearing at the club or on the red carpet, this burgundy slim fit blazer just has the look you need to be see sporting. Made of microfiber.